Bouvet-Ladubay, Saumur is not a member of Wein‑Plus yet. By creating Bouvet-Ladubay saved filter, you will see relevant matches on your home screen. 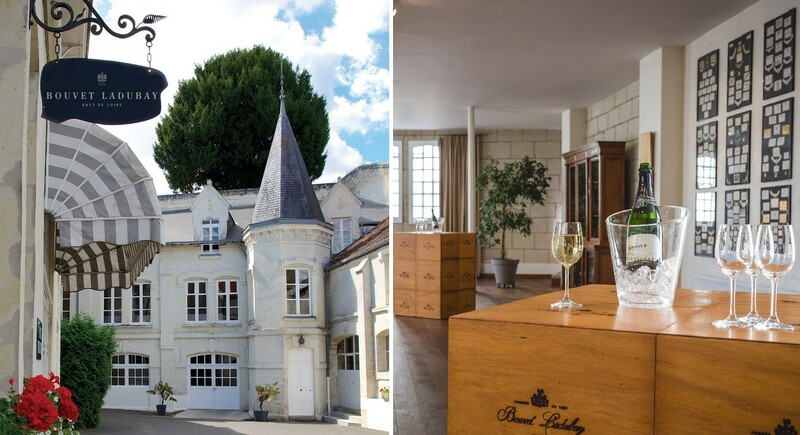 The head office of the sparkling wine house lies in the municipality Saint-Hilaire Saint-Florent on the left bank of the Loire near the city Saumur, It was founded in 1851 by Etienne Bouvet (1828-1908) and his wife Célestine Ladubay by buying an eight-kilometer cellar. The cellars carved into the tufa once belonged to the abbey "La Belle d'Anjou", built as early as the 11th century. 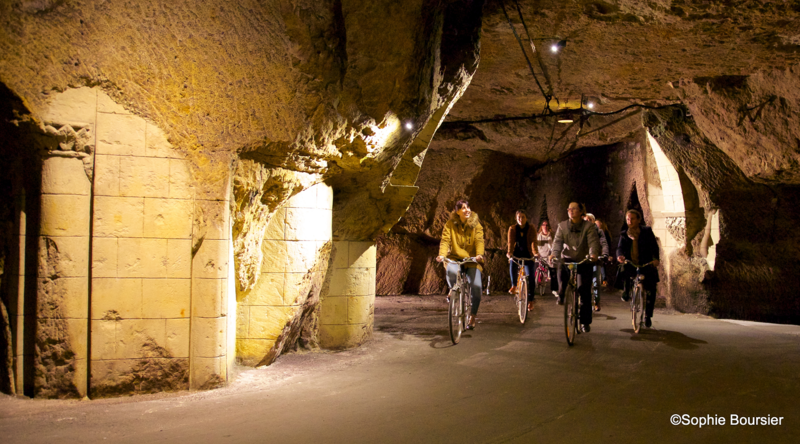 By the way, cellar visits are offered by bicycle. The coat of arms with the two silver lions was created in 1873. From this year, privileged customers have the opportunity of a personalized label offered and the company official supplier of the British Parliament. In 1878, a castle and workers' settlements were built for the employees. In the following years, a small theater and its own power plant was built for the winery. Bouvet left no descendants. Weakened by the First World War and the Great Depression in 1929, the Bouvet Empire in 1932 was on a auction dismembered and sold. The sparkling wine production plant was taken over by Justin-Marcel Monmousseau, succeeded in 1946 by his son Jean Monmousseau and in 1972 his son Patrice Monmousseau. After the Second World War, the company succeeded in regaining its reputation through quality-oriented production and expansion of exports. In 1974 Bouvet-Ladubay became a champagne house Taittinger but with Patrice Monmousseau total freedom of action remained in the management of the house. In 2006, the company was founded by Indian multimillionaire, manager and entrepreneur dr. Vijay Mallya, who also serves as chairman of the international beer and spirits company United Breweries Holdings Limited. Finally, in 2015, it was repurchased by the long-standing owner family. Together with his daughter Juliette Monmousseau, the general manager of the house, Patrice Monmousseau founds the investment holding Ogmius Capital. Together with some partners, the Monmousseau family bought back 100% of the company's shares and gained full independence. In order to promote its image, the company engages itself in Saumur's historic equestrian sport, in motorsport with a seven-year participation in the famous "24 Hours of Le Mans" and a wide range of cultural sponsorship in the fields of painting, sculpture, dance, theater, literature and finally also movie. The art center "Bouvet Ladubay Art concept" was inaugurated in 1992 in the premises of the former large power plant and exhibits works of contemporary artists. Afterwards, the private theater built during the Wilhelminian period was restored and used for events, concerts and theater performances. After expanding in stainless steel tanks or for the special cuvées in After bottling, the second fermentation ( bottle fermentation ) started. The remuage (Rüttelung) carried out by means of Patrice Monmousseau invented mechanical devices. After this dégorgement and admitting the Dosage The closure is done with natural cork and the last step is the labeling. The extensive product range includes AOC still wines such. B. Saumur and Touraine and about 15 sparkling wines such. B. Crémant de Loire, Among the top products of the house are the sparkling wines "Saphir Vintage" (Chenin Blanc and Chardonnay, Saumur Brut) and "Trésor" and the 10 years yeast-aged "Ogmius" (both Chenin Blanc and Chardonnay, aged in oak barrels, Saumur brut ). Every year more than six million bottles are produced.